If you haven’t visited HouseSight yet, check it out today! 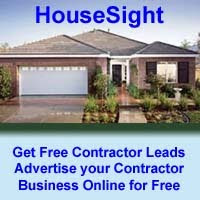 It could help your business grow and cost you nothing.HouseSight is a home building/improvement themed social networking servicewhere homeowners, builders and contractors post pictures, videos anddescriptions of their various projects for other HouseSight visitors toview. The HouseSight service is free and you can create as many projectsas you’d like. Other contractors and builders find it a great place toadvertise their business, at zero cost. If interested, check it out at HouseSight! Are you looking at doing a basement remodel? Are you planning to do the work yourself or are you planning to hire a basement remodeling contractor. 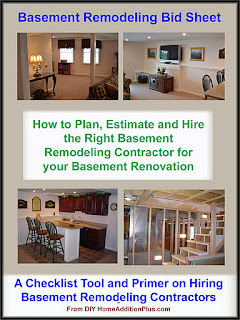 If you’re planning to do the latter, then you need my “Basement Remodeling Bid Sheet” from HomeAdditionPlus.com. 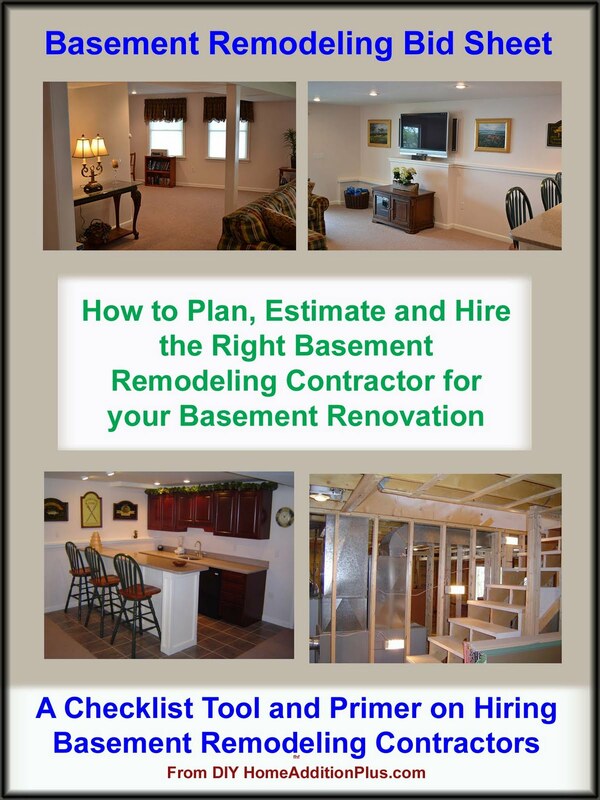 My “Basement Remodeling Bid Sheet” will help you find the best basement remodeling contractor for the job. It includes an extensive questionnaire that you provide to your prospective basement remodeling contractors to fill out. You can then compare the completed questionnaires with each other and with my “Homeowner Advice” section in the bid sheet. By doing an apples-to-apples comparison of completed questionnaires and comparing answers to my homeowner advice tips and recommendations, you’ll be able to hire the right contractor for your basement remodeling project. The “Basement Remodeling Bid Sheet” also provides a wealth of additional information including projected basement remodeling costs for a sample project, timelines for completing the various phases of a basement remodeling project, and types of basement materials you may want to consider using in your project. In addition, it includes a separate basement remodeling project estimator spreadsheet tool that you can download and use to estimate and track your actual basement remodeling costs. The “Basement Remodeling Bid Sheet" will inevitably save you a small fortune in money, time and hassles in completing your own basement remodel so check it out today. If you have plans for a new kitchen remodeling project make sure to take a look at my “Kitchen Remodeling Bid Sheet” from HomeAdditionPlus.com. 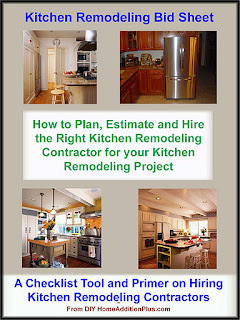 It will help guide you through the search process for hiring a kitchen remodeling contractor. It includes a detailed questionnaire that you provide to prospective kitchen remodeling contractors for them to fill out. You can compare their answers with other prospective kitchen remodeling contractors and the Homeowners Advice section in the back of the bid sheet. With my “Kitchen Remodeling Bid Sheet” not only will you be able to find the right kitchen remodeling contractor for your kitchen remodel, you’ll be sure to save money in the process. By comparing bids based on the same questionnaire form, you’ll be able to do an apples-to-apples comparison between contractors. As a result, you’ll be less likely to be bamboozled by a mish-mash of confusing kitchen remodeling contractor quotes. 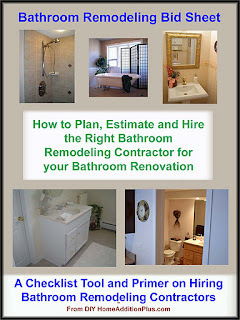 Hiring a quality bathroom remodeler to tackle your bathroom renovation project can be hard to do. Finding a bathroom remodeler who understands general contracting and who also has a pulse on the latest bathroom remodeling design trends is very difficult. Hire the wrong bathroom remodeler and you may end up with a renovated bathroom that is functional but lacks any style or pizzazz. On the flip side, you could hire a bathroom remodeler who has great bathroom remodeling ideas but lacks the skill sets to bring it to fruition. My “Bathroom Remodeling Bid Sheet” from HomeAdditionPlus.com can help find the perfect bathroom remodeler for your bathroom renovation project. 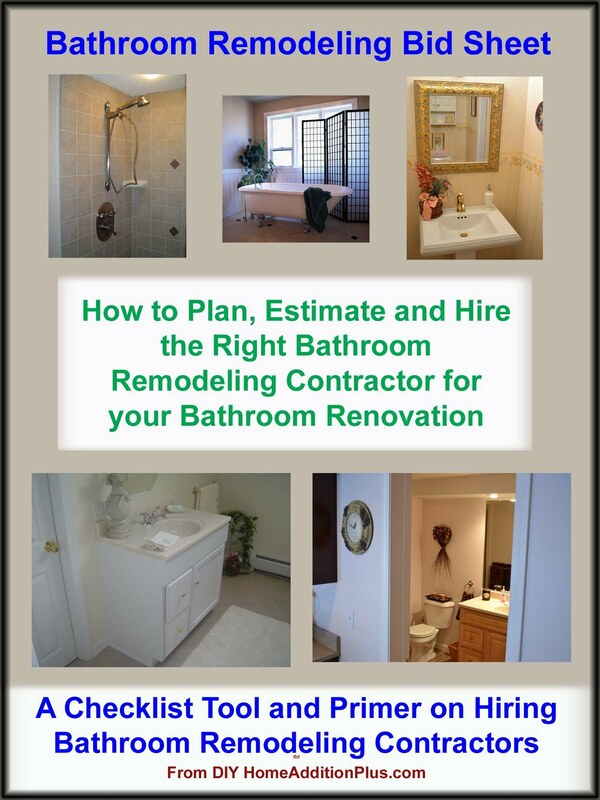 It includes a detailed questionnaire that you provide to prospective bathroom remodeling contractors to fill out. You can then compare their responses with the Homeowner Advice section in the “Bathroom Remodeling Bid Sheet” to identify the right bathroom remodeler for your bathroom renovation project. The “Bathroom Remodeling Bid Sheet” is inexpensive and can save you hundreds or thousands of dollars in your bathroom renovation project. In addition it will save you time and hassles in realizing your bathroom remodel, so check it out today at HomeAdditionPlus.com! Bathroom remodels are a hot ticket in the home remodeling industry today. With more homeowners convinced that they will be staying in their homes a lot longer than they had originally planned many are opting to improve the live-in value of their homes. Many homeowners view a bathroom remodel as the perfect place to start in improving their home’s living space. It’s a room that gets a lot of use, its relatively small in space, and there are a variety of features that can be included in it to accommodate any budget. However, prior to jumping into a bathroom renovation project it is wise to first do your homework and make a decision on whose going to do the work. If you plan to hire a bathroom remodeling contractor than you’ll want to purchase my “Bathroom Remodeling Bid Sheet” from HomeAdditionPlus.com. It is a bathroom remodeling guide that helps you find the right bathroom remodeling contractor for your specific bathroom renovation goals. The “Bathroom Remodeling Bid Sheet” includes an in-depth questionnaire that you provide to prospective bathroom remodeling contractors for them to fill out. Upon return of the completed questionnaires you can compare them to the Homeowners Advice section in the bid sheet. After comparing the various questionnaire responses to my bathroom remodeling advice section of the bid sheet, you’ll quickly be able to determine who is the right contractor for your bathroom remodel project. So before hiring any old contractor off the street, check out my “Bathroom Remodeling Bid Sheet”. The last thing you want to do is hire the wrong contractor and end up wasting thousands of dollars on a bathroom remodel that doesn’t achieve the features and look that you are ultimately seeking in your renovated bathroom. If you’re contemplating having a wood floor installed it’s important that you install the right wood floor product for your application and that it is installed by a true professional wood flooring installation contractor. If the wood floor is not installed properly, in short order you could find your new wood floor with unsightly gaps or even worse buckling. Finding a wood flooring installation contractor that does exceptional work, however, can be a challenge. 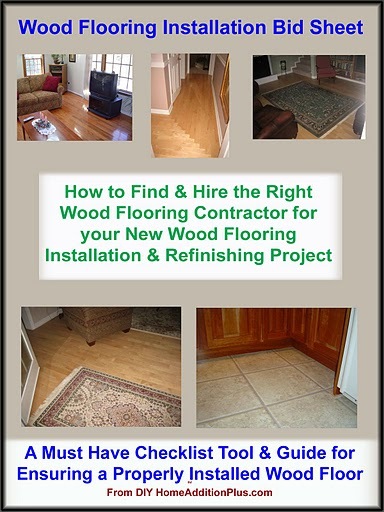 My wood flooring installation guide can help you in this search. My “Wood Flooring Installation Bid Sheet” from HomeAdditionPlus.com is specifically designed to help you identify the right wood flooring installation contractor for your project. It includes an in-depth questionnaire that you provide to prospective flooring contractors for them to fill out. Upon return of the completed questionnaires you can compare them to the Homeowners Advice section in the bid sheet. After comparing the various questionnaire responses to my wood flooring installation advice section of the bid sheet, you will quickly be able to determine who is the right flooring contractor for your wood floor installation project. So before you “go-with-the-flow” and settle with a home improvement center’s recommended flooring installer, check out my “Wood Flooring Installation Bid Sheet”. Remember, a home improvement center is focused on very low cost and as a result they squeeze every possible dime out of the contractors they recommend. I’ve heard many contractor horror stories from those who have worked for one of the large home improvement box stores. As a result, the home improvement stores often hire the least skilled contractors or those willing to take short cuts to get their business. Regardless of how good the flooring product is itself, an improper installation can ruin your plans for a beautiful wood floor. 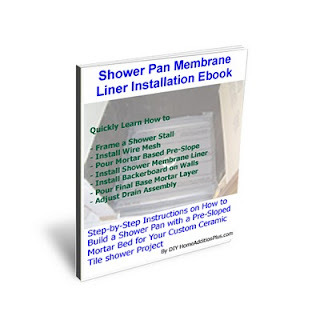 My “Shower Pan Membrane Liner Installation” Ebook continues to be the best guide on the market for installing mortar shower pans. When it comes to installing shower pans for custom ceramic tile showers there is simply not a better guide on the market. 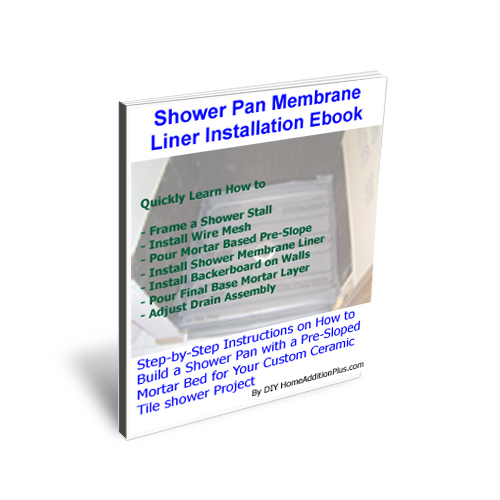 The “Shower Pan Membrane Liner Installation” Ebook provides step-by-step instructions on how to install a shower pan, and each section includes helpful instructional pictures. It’s also comprehensive. My ebook covers everything from framing the shower stall area to making the finishing touches on the mortared shower curb. And it’s not just me saying so! Listed below are just a few of the comments from homeowners who have purchased my shower pan installation guide over the years. So before you start installing your own shower pan order my “Shower Pan Liner Installation” Ebook from HomeAdditionPlus.com. It’s inexpensive and will save you a fortune. Keep in mind that just one small leak in a shower pan could cost you thousands of dollars in damages and repairs. Don’t let it happen to you! Drywall water stains on ceilings and upper walls are typically caused from roof leaks. Check your attic to look for signs of water infiltration from the roof. Look for dark stains on the roof sheathing or roof rafters. If you can’t find any telltale signs of water infiltration, inspect your attic on a rainy day to see where the water is coming in. If you find the offending area, wait until a dry and clear day and inspect the roof for damaged shingles or popped nails. Often the leak occurs higher up than where the water is entering the attic. Also check around chimney flashing and roof flashing. If the flashing becomes lose, water can get behind it and work its way into your home. If you live in a climate where there is heavy snow, roof snow melt can occasionally find a way underneath the flashing that is connecting a roof to an intersecting wall. Water can then work its way down the drywalled walls and form stains and large water balloon shaped bulges. Air conditioning systems located in attics can also cause drywall water stains on ceilings and walls. If an air conditioner’s condensation drip line becomes clogged, or there is condensation forming on any part of the duct work, the water droplets can drip onto the drywall ceiling and form drywall stains on the ceilings. Each homeowner that purchases a Home Addition bid sheet from HomeAdditionPlus.com save's hundreds and thousands of dollars on their particular home improvement project, be it new home construction, a home addition, a kitchen remodel, a bathroom remodel, etc. And that's not just HomeAdditionPlus.com saying it. It's customers are also saying the same, and they've been saying it for years. Below is just a snap shot of the customer feedback on HomeAddition Plus.com's bid sheets.
" Hi Mark, I purchased the New Home Construction Bid sheet download today. We are very satisfied with it and will find the information contained in the document very helpful." Thank You!" Justine S.